Design #1945 by S&S. She is listed by S&S as "Adios II"; might have sailed under this name for another country. A guess: As MX-2, in Acapulco, 1968? Designer is Sparkman & Stephens, builder Barnett, Wm.H. Pty Ltd, McMahon's Point, Sydney 1968. First owner Norman George Booth. 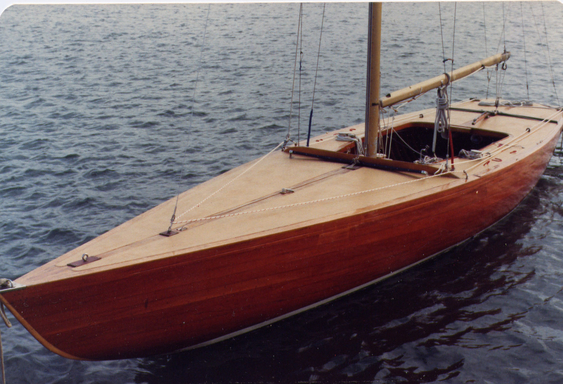 After a modification (new fin keel etc) raced by Frank Tolhurst 1972 in Geneve Worlds (9th)and at Hankö winning Gold Cup. 1986 Sydney Worlds (14th) and 1987 in Hankö Worlds (16th). The boat is now in South Norway N-52. Please help to complete or correct the infos if you have some complementary others. Tks.